We all experience hypnotic states. Hypnotic states occur naturally and spontaneously in everyday life. We have all found ourselves daydreaming and losing track of time, or even doing routine mundane tasks while thinking about something else to the point that we can’t actually remember performing the task. Clinical Hypnotherapy deliberately induces a kind of relaxed state of awareness. Once the mind is in a relaxed state, therapeutic suggestions can have great effect on attitudes, perceptions and behaviours. Hypnotherapy promotes particular brain wave activity that allows the mind to take in and adopt new ideas, and accesses the ‘ subconscious mind’, which is more open to new ideas than the rational ‘ conscious mind’ and controls all our ‘ automatic’ behaviours. Suggestions may be taken to heart, but only if those suggestions are acceptable to you. Contrary to popular belief, you can’t be hypnotised into doing things against your will. You can’t be forced into a hypnotic state either. Instead, you allow yourself to be hypnotised. It is a partnership between you and your Hypnotherapist and a voluntary altering of your own consciousness, YOU are always in control. In other words, you are hypnotising yourself. You might have read online elsewhere sellers promising 100% success rate immediately. I think that sort of thing is very sad, and sets many people up for failure. On the one hand it inspires people to walk away convinced that they are now experiencing the results they desire - which is wonderful – but it does leave a lot of other people very disheartened when they don’t achieve immediate results. The bottom line though always is that you really do need to want to make the changes in your life. It’s impossible to make a person do what they really don’t want to do under Hypnosis or Hypnotherapy. If you really don’t want to change your behaviour, NOTHING will make you. You have total control over your own mind whether you want to, or not. This is important to remember if you are buying any of our range as gifts. For example, if the person you have bought them for isn’t ready and committed to quit smoking, all you would be giving them are shinny coasters. Another important thing to factor into your decision to utilise Hypnotherapy is the fact that it takes at least 21 Days to form a new habit. I’m sure it would have taken you MUCH longer to ingrain the behaviour you are trying to change now. It’s VERY important that you are committed to listen to AT LEAST one Hypnotherapy session DAILY. Any lasting change has to come from your subconscious mind so you will automatically behave differently. Changes often happen during these 21 days without you consciously being aware of any improvement. This is why it is so important to continue for the full 21 days – even if you notice change – for this to become lasting. You have to be fully committed to follow this process so you will succeed. I guarantee it. 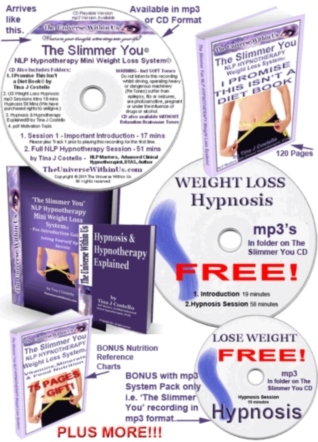 The Slimmer You NLP Hypnotherapy Weight Loss System© comes complete with best-selling I Promise This Isn't Diet Book© and MUCH MORE. Based on the successful principles used in the FULL system, you will find in this the final solution for all of your weight loss issues. Just look at the image to the left to see the HUGE size of this System. Each time you listen to your The Slimmer You NLP Hypnotherapy Weight Loss Session© your feelings will become stronger and stronger. You will see yourself differently and your physical body shape will follow effortlessly. You will GENUINELY look forward to your NLP Hypnotherapy Session© each day as each session brings with it NEW experiences as your imagination takes you on different healing journeys. At the end of each session you will feel happy, proud, strong and EMPOWERED! The Slimmer You Slimming to a Beat© CD by Tina J Costello - 53 minutes - consists of 230 softly spoken weight loss affirmations which are echoed even softer to become 460. You can barely hear them behind the up-tempo synthesised music and they are not designed to be the focus of your listening. Woven even deeper into the recording are weight loss subliminal messages. The Slimmer You Slimming to Sleep© CD by Tina J Costello - 53 minutes - contains the same 230 softly spoken weight loss affirmations which are echoed even softer to become 460, plus the subliminal messages. With this recording you can clearly hear the affirmations though. The mix of the recording is different to The Slimmer You Slimming to a Beat© because the focus of this recording is to lull you to sleep. It contains a beautifully relaxing background music track as well as the calming sounds of the ocean at twilight. It is truly a piece of heaven which will have you nodding off to sleep in no time while your subconscious mind continues to work on your behalf. The Calmer You© has been especially recorded so the listener can be in complete control of the direction they proceed in a safe and relaxed environment. Each time it is played it can be completely different as it is entirely based on your own thoughts and experiences. At a full 80 minute duration– which passes remarkably quickly - you are taken on a journey into a deep state of relaxation and proceed through guided meditation discovering your individual anxiety issues along the way. Through the Clinical Hypnotherapy component you alter the way you view your anxiety and are provided the opportunity to release the feelings and emotional energy that fuels chronic anxiety. Meet & Defeat Anxiety: This popular and comprehensive Cognitive Behavioural Therapy Workbook has now been released to partner The Calmer You© Clinical Hypnotherapy session in eBook format. On its own, this 180 page workbook has provided help for thousands of anxiety sufferers. It is written in a non-technical manner, but packed full of practical assistance and exercises for to you to be able to Meet & Defeat Anxiety©. Progressive Muscle Relaxation is wonderful for anybody, but it is particularly recommended for anxiety suffers. The exercises on this recording are backed by very SOFT relaxing background music. For more details click the button below. The Relaxed You© Series ( Stress or Pain Relief) has been especially created to marry several sessions together based on the common theme and relaxation. When we are relaxed we are able to make real and lasting changes in our lives. Tina allows the gentle combination of guided Progressive Muscle Relaxation Exercises and a relaxing Subliminal Messages Session to achieve the desired results. You will also discover a Free Gift which is a US Hypnosis session. Clearly a qualified professional, this practitioner offers a very good session. This completes the trio in each of The Relaxed You© Range. Also included is The Relaxed You© Progressive Muscle Relaxation eBook by Tina J Costello.This book provides the reader with additional information with regards to Progressive Muscle Relaxation Exercises and breathing techniques - like Calm Breathing and Breathing from Your Diaphragm- as well as many other interesting exercises. Tina felt that there was a need for a book like this to accompany the physical Progressive Muscle Relaxation Session and we are sure you will discover the benefit as well. You will find this pdf eBook when you put the CD into your computer and look at the files the CD contains. Metta is an attitude of recognising that all sentient beings - that is, all beings that are capable of feeling - can feel good or feel bad, and that all if given the choice, will choose the former over the latter. The starting point of Metta is in our thoughts. Treat yourself with healing loving kindness first and let it flow naturally from you to others. Try it. It will change your life in more ways than imaginable. Let our Loving Kindness Meditation Session© become your first step. Here you will discover three Meta Meditation productions in CD and mp3 format. You will also receive and Instruction Booklet with this purchase containing information to assist you to receive the most from your Meta Mediation sessions. As a special gift from us, we are offering a copy of our Yearly Gratitude Journal / Diary which you can print out as many copies as you would like to give to family members and friends. A Gratitude Journal is invaluable at any age. The very young can enjoy drawing what they have been grateful for during their day, and the elderly are reminded how wonderful their lives still are. For the rest of us in between it enriches our lives beyond measure.This will be emailed to you at the time of purchase. In life, confidence could well be the most important characteristic a person could have. It is more important than race, gender, body stature, abilities, skills, knowledge, wealth, and even experience. The list could go on and on. It really doesn't matter if you are the best looking, brilliant, highly-skilled, most experienced person, because if you don't have self-confidence those wonderful attributes are mostly waisted. This session is one of the stars of The Confident You© Set and is where most of the reprogramming will be done. It starts in a structured Hypnotherapy format by helping you to achieve a deep state of relaxation. Like many of The Universe Within Us sessions The Confident You© does contain brainwave entrainment tones( please see warning at the bottom of this items page) which will assist you in getting to a place of deep relaxation much quicker and easier. This session takes you on a journey to correct any false self-beliefs you may have obtained during your life. 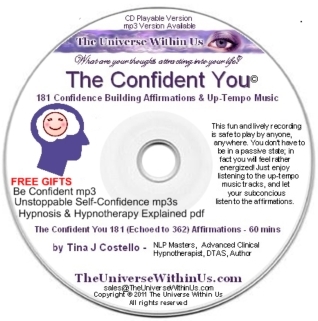 This is the third CD in The Confident You© Set and focuses completely on affirmations. The Confident You 181 Confidence Building Affirmations© (echoed to 362 affirmations) is a recording which goes for a full 60 minutes. This is a fabulous recording of up-tempo music tracks to accompany the affirmations. Everyone LOVES this recording as they consciously forget the affirmations and purely enjoy the music. The subconscious mind will do all the work of listening to the affirmations for you. This is great to have playing in the background in the car, or on your mp3 player while you exercise, or while doing absolutely anything! This CD is very loving and beautiful. 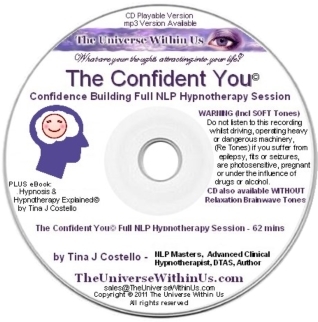 It runs for 72 minutes and is a full NLP Hypnotherapy session in three parts.The start of the session is a hypnosis deep relaxation session setting the stage for sleep – you are supposed to fall asleep listening to this CD. This continues on to the NLP Hypnotherapycomponent which is predominantly focused on Self-Love. These components equal 40 minutes of the recording, and are then blended seamlessly into the sleep stage which contains 121 Self-Esteem and Confidence Building subliminal messages (echoed to 242).For more details about this truly heavenly CD click the button below. I Now Choose to Live Smoke-Free© is a fully comprehensive System which guarantees success. Not only does it contain 4 CD'sbut also additional tools to keep you motivated and on track.This is the star of this Pack. I Now Choose to Live Smoke-Free© is a complete 57 minute Hypnotherapy Session- 57 minutes of only FULL hypnotherapy. Also included within this hypnotherapy session is 25 spoken affirmations – and as they are echoed, they become 50 for your subconscious mind. The Confident You© FULL 62 minute hypnotherapy (not hypnosis) recording is included in this pack, as well as is I Now Choose to Live Smoke-Free© 210 Affirmations (echoed to 420 affirmations) recording. This is a fabulous 63 minute recording of up-tempo music tracks to accompany the affirmations. The final CD in our I Now Choose to Live Smoke-Free System© is our 10 Minute Boost Break© recording. Included on this CD you will also find Daily Accountability Planner© and Reminder pages. As with The Confident You© Set we are also making two of the sessions from I Now Choose to Live Smoke-Free© System available for those on a budget as single CD's/mp3 Discs – for a limited time only. One of the stars of I Now Choose to Live Smoke-Free© is a complete 57 minute FULL NLP Clinical Hypnotherapy Session. Included within this Hypnotherapy session is 25 spoken affirmations – and as they are echoed, they become 50 for your subconscious mind. This recording contains brainwave tones as well as other sound surprises. This session from I Now Choose to Live Smoke-Free© 210 focuses on Affirmations (echoed to 420 affirmations) runs for a full 63 minutes. This is a fabulous recording of up-tempo tracks of music to accompany the affirmations. As this recording contains no brainwave tones, it is safe for anyone to listen to anywhere. Everyone LOVES this recording as they consciously forget the affirmations and purely enjoy the music. The subconscious mind will do all the work of listening to the affirmations for you. You don’t have to be in a passive state to listen to this CD; in fact you will feel rather energised! This is great to have playing in the background in the car, or on your mp3 player while you exercise, or while doing absolutely anything! As with the previous CD’s the mp3 version will be found in a folder on this CD.